Nearest: Tube Station: Bayswater 299 yards (273 metres), Railway Station: London Paddington 0.4 miles (0.6 km), Motorway: M4 Junction 1 4.4 miles (7.1 km). There are 5 tube (underground) stations within half a mile (0.8 km). The Duke Of Leinster Hotel London is situated in Bayswater close to Paddington. This is a location is close to central London and convenient for all of London's attractions. Nearby attractions and places of interest include Portobello Road Market, Natural History and Science museums, Hyde Park and shopping at Queensway, Notting Hill and Kensington. Leinster Gardens is a residential side street off from Bayswater Road. You will find many similar type of properties in this area where former townhouses have been converted into mid-range accommodation. The surrounding are provides a range of amenities including shops, bars and restaurants. The Duke of Leinster is a modern contemporary hotel housed in a former Edwardian residence and has forty two en-suite bedrooms, each individually decorated. Facilities include free wireless internet access, direct-dial telephone, flat screen television, safe, desk, fridge, hairdryer and welcome tea/coffee tray. Room service runs till 14.00. Hotel has a lift. The Duke of Leinster hotel serves both continental and full English breakfast in the dining room (07.00 till 10.00) or guests can enjoy morning tea or coffee in the juice bar. Reception is open for guests 24 hours a day. WiFi internet available at this hotel. There is a room for luggage storage. Laundry, dry cleaning, fax, photocopy and currency exchange services. Compared to other London hotels: This hotel has been rated 69% by past guests. The London average is 80% and the average for 3 star hotels is 76%. Therefore this hotel is below average for its sector (star rating) . Milesfaster ranking: 739th from 866 London hotels, and 252nd of 329 three star rated hotels. Another to Consider: Another hotel that is much like the Duke Of Leinster and not too far (0.3 miles, 0.6 km) would be the 3 star Travelodge Aldgate East, where prices begin from around £59 and which has a 60% guest satisfaction rating. 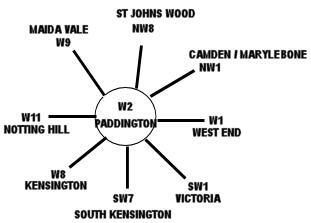 The 50 hotels nearest to this location (20 Leinster Gardens, W2 postcode) that we list cover a 0.4 miles (0.7 km) radius. The 50 consist of 1 five star hotel (rated 89%), 22 four star hotels (average rating 80%), 19 three star hotels (average rating 70%) and 8 two star hotels (average rating 66%). Top 3 star hotel is Phoenix Hotel at 82%. Of these hotels the highest rated is Royal Park Hotel (4 star) at 90%. Base Rates: A look at how hotels compare for starting rates (base rates). These published rates are long term rates so do not take account of special deals and offers. We have calculated the average base rate for all the 50 nearby hotels at £102 per night. The low end of the scale shows rates from £11 at Smart Hyde Park View Hostel (2 Star, 71%) to a high of £720 at Commodore Hotel (4 Star, 60%). Rate averages for each star rating: Five Star average: £269, Four Star average: £145, Three Star average: £68 and Two Star average: £44. We rank hotels based on their guest rating but balanced for their influencing factors and we rank Duke Of Leinster 37th (joint) of 50 nearby hotels and 12th for the 19 three star hotels in the area. Compared to the nearest alternative hotels this hotel is 24th of 50 (13th of 19 three star hotels.) for base rates. Balancing the hotels rates and user rating we rank the hotel 42nd of 47 when judging the balance of price point to user rating (Smart Hyde Park View Hostel was top).